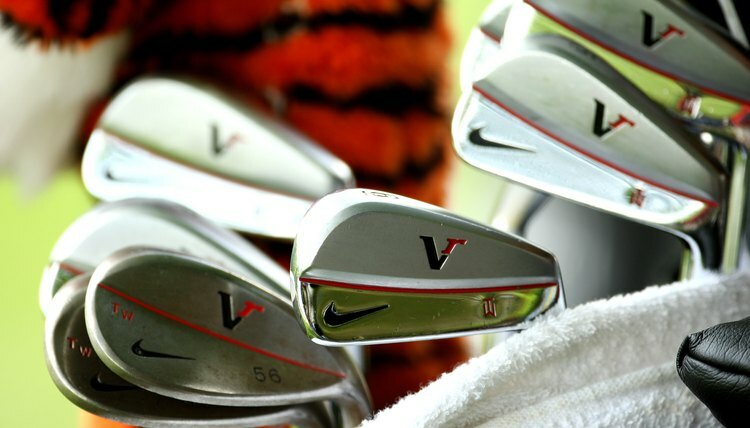 Recent innovations give golfers many options when it comes to their irons. The irons comprise approximately 65 percent of the golf clubs in a standard set. The evolution in their design has advanced as rapidly as any other facet of the game, because of changes in agronomy and the use of physics and computer-aided design. In golf's infancy, irons were forged by blacksmiths and were extremely heavy with large hosels or shanks. It wasn't until drop forging was discovered that they became smaller, lighter and more streamlined in their design. Another development in the design of irons was the addition of scoring lines to the face of the club that imparted spin and gave the shot more carry in the air. Muscle-back or forged irons became the norm as club design progressed. They are so called because the weight of the head is more evenly distributed across the back of the club, giving it a muscular appearance. This type of iron resembled a blade and some manufacturers integrated the term into the name of their product, e.g. Wilson Tour Blades. Forged irons had a sweet feel when struck properly but were not very forgiving when miss-hit. Cavity-back irons derived their name from the fact that some of the weight from the back of the iron was moved to the perimeter of the club head, leaving a cavity at the back of the iron. They are also referred to as perimeter weighted clubs and are more forgiving than a muscle-back iron. The design of these clubs is aided by the use of computers that are able to increase the hitting area or "sweet spot" of the club. With the advancements made in metallurgy, these types of irons have increased in size without the burden of extreme weight. The development of wedges has also evolved as manufacturers experiment with different flange designs to aid the golfer in obtaining optimum spin on the ball, enabling it to stop quicker on the green. At first glance, the sole of a sand wedge may appear to be just a huge mass of metal, but careful consideration has been given to the placement of the weight, and the camber and roll of the club. Golf club innovators realized that the hosel of the club was really a wasted use of precious weight that could be utilized in a more efficient manner. They eliminated the hosel of the club and redistributed the weight to the club head. This transformed dead weight into useful mass that helped propel the shot and lowered the club's center of gravity. Callaway Golf is credited with leading the field in this discovery. Hybrids are a cross between a wood and an iron that have become extremely popular because they are easier to hit than the long irons. The front of the club looks like a long iron, while the back of the club resembles a wood, but not as bulbous in appearance. Lawrence Malestic grew up around the game of golf, first as a club caddie at North Shore Country Club in Glenview, Illinois. He then became a professional, caddying on the PGA European Tour for 2 seasons and the Senior PGA Tour for 12 years. His former bosses include Orville Moody, Bruce Crampton, Chi Chi Rodriguez, Gary Player, Lee Trevino and Tom Weiskopf. What Is a Forged Iron Golf Club? What Do the Color Dots on Ping Golf Irons Mean?